إذا كنت تبحث عن عقار بموقع جيد في المدينة، فقد وجدت ضالتك في Pacific Views Resort. يسهل الوصول إلى هذا الفندق ذو 4 نجوم من المطار، فهو يبعد عنه مسافة 27 km فقط. يقع هذا الفندق الحديث على مسافة قريبة من المعالم السياحية الشهيرة. يقدم Pacific Views Resort خدمات لا غبار عليها وكل أشكال اللياقة وحسن الضيافة اللازمة لإسعاد ضيوفه. إن واي فاي مجاني في جميع الغرف, خدمة سيارات الأجرة, تسجيل وصول/خروج سريع, تخزين الأمتعة, واي فاي في المناطق العامة هي جزء فقط من الخدمات التي تميز Pacific Views Resort عن باقي الفنادق في المدينة. تتضمن كل غرف النزلاء وسائل الراحة والتسلية المصممة خصيصاً لضمان الراحة القصوى للضيوف. صممت خدمات الاستجمام في الفندق والتي تتضمن حوض استحمام ساخن, مركز للياقة البدنية, ساونا, حمام سباحة خارجي, حمام سباحة داخلي لمساعدتك على الاسترخاء والراحة. إن Pacific Views Resort هو مكان مثالي للمسافرين الذين يتطلعون إلى الراحة والاستجمام في المدينة. يفرض رسم إضافي بنسبة 3% عند استخدام بطاقة ائتمان أمريكان إكسبرس. جناح بغرفتي نوم مع طلّة على البحر. Upon arrival the Pacific views looked promising with easy to navigate underground car park and high speed elevators. Unfortunately after enterng our room we quickly assumed a mistake had been made as we had paid for an ocean view apartment and we received a city side apartment. Without hesitation i rang reception where i explained the situation. The lady said "Did you book a 1 bed apartment " To which i replied 'yes'. She said "well all the one bed apartments are city side but you can still see the ocean from the corners" Me: Well i booked an ocian view.. Her: .... Me: ... well thats not very acceptable and somewhat disappointing as thats not what i paid for. Her:... well thats what they are. Me: ok thanks, bye.. 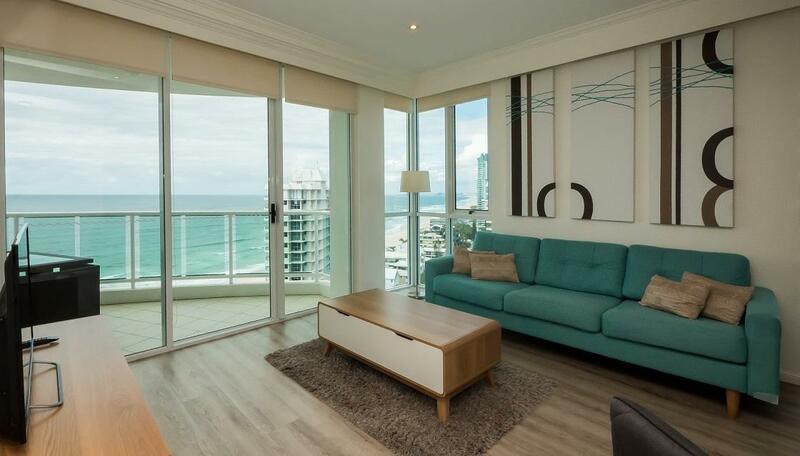 So to anyone staying here just note that if you are getting a 1 bed apartment 'ocean view' you are actually getting a city side apartment. It also suffered a dripping shower head, left over hair in bathroom and mould around shower base. Good location. 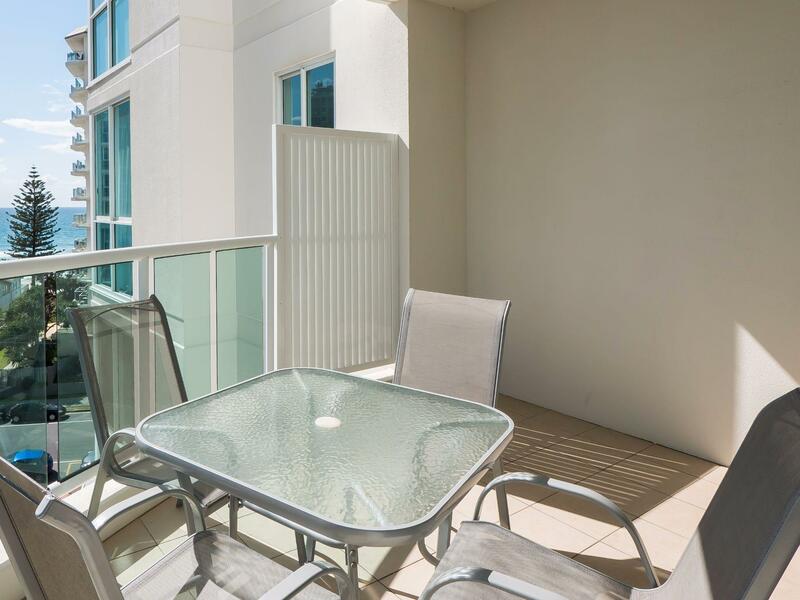 Within walking distance to nearby restaurants and cafes. 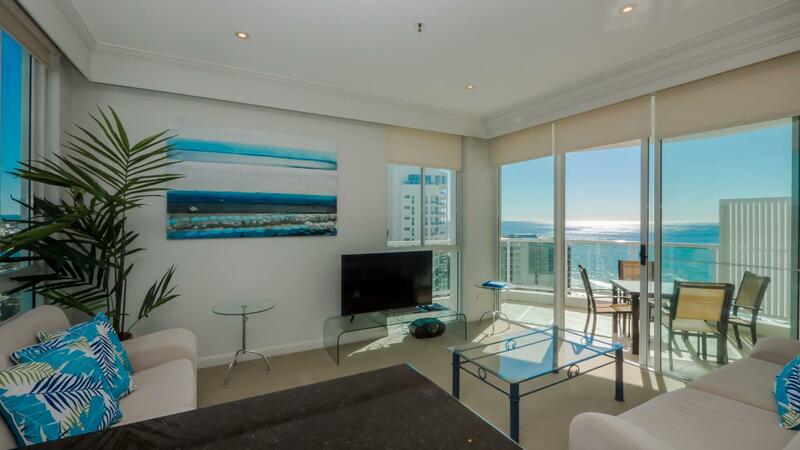 Our highlight is the spectacular view with high floor 2 bedrooms. Not much facilities in the hotel which isn't a concern for us. Self service parking, extremely convenient. Everything is perfect. Perfect view and the surrounding, ambience during day time and night time was peaceful, not as busy as Surfers Paradise. 7 11 is just downstairs. There are several cafes nearby at Tedder Ave. My kids and parents enjoyed the resort as it offers good views of the ocean and also, the rooms as well as living room is well kept and clean. The toilets is huge and clean too, except that the water takes quite some time to heat up even though we are using the water heater. Apart from that, there isn't a fulltime service to service room, change the towels frequently but there is washing machine plus dryer for you to do the laundry. We will definitely come back here again to Gold Coast and stay at this resort again. Thank you for the wonderful and helpful staffs too. Arrived late after reception hours so collect room key from the drop down box. Every unit here is unique so Im reviewing unit 28. Everything is provided except toothbrush and toiletries. Bar soap and small tube of shampoo is provided and that’s it. Love the views from each room. Shops are short walk away but prices in shops are more expensive than those in supermarket. 7-11 downstairs, convenient if need something urgently. However the sofa seems very old and dirty and it sinks in, perhaps time to change a new one. 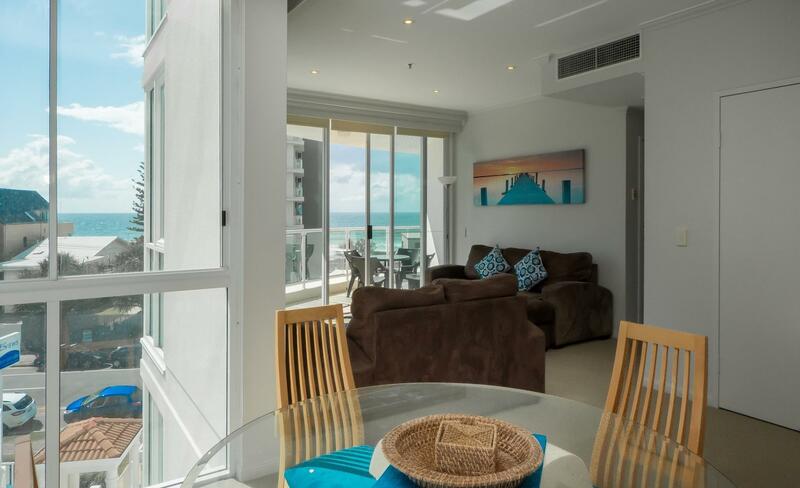 Convenient, near to tourist attractions (driving distance) such as Sea World, Movie World, Australian Outback Spectacular, beach, convenient stalls, etc. We had a beautiful view of the beach from our rooms, the rooms were very clean & bright, wifi connection was excellent. The reception personnels were very accommodating , friendly & very helpful. Highly recommended ! Awesome place ! The only pro is the noise coming from the utility room that houses the air-condition compressor. Nevertheless, it's still an awesome place... We love it much & will surely be back if we ever return to Gold Coast. 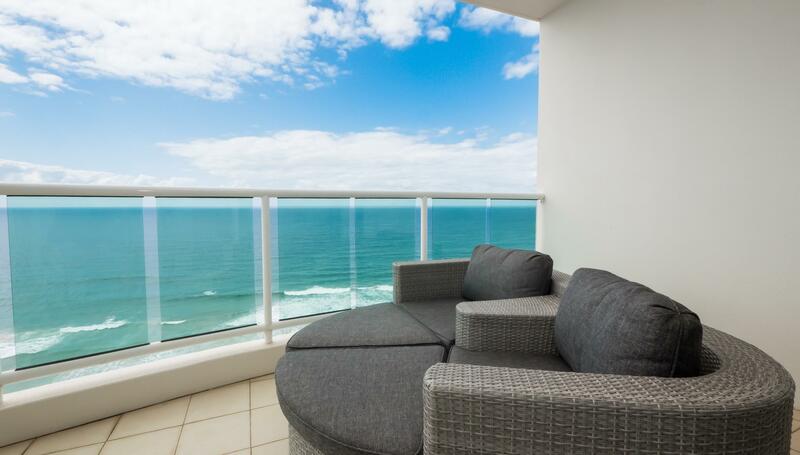 We stay at Level 19 and love the view from the apartment! It was so close to the beach, just across the road. Check-in & out was smooth and swiftly. Beds was very comfortable and balcony link to all rooms with great ocean view. Will definitely recommend friends to stay at Pacific View Resort. Enjoyed our stay thoroughly. Utensils were all provided for making it easy for us to prepare our daily meals. Rooms are spacious and the view from each room is spectacular. All around balcony makes it even more awesome. Would definitely come back again. Comfortable stay. Spacious two bedroom with equipped kitchen utensils and washing machine. Except that there was no dish-washing liquid and clothes detergent provided, no basics such as cooking oil, salt and pepper. The place was clean but a little dusty for the quilt cover. Was there last year in November, and would probably be staying there again this November with another group of friends. Recommended for the comfort and value for money. 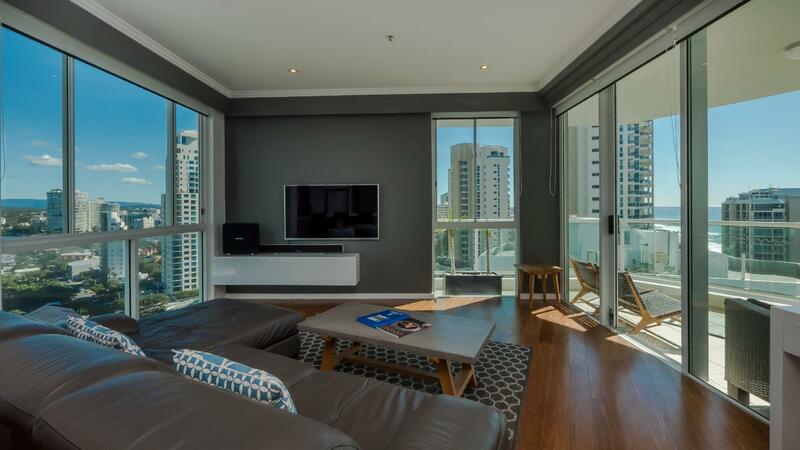 Tried out this apartment as it was strongly recommended by fellow Singapore Families travelling to Gold Coast. We will definitely stay back at this place. Location is good and just cross the road onto the beach for short swim. Car park is secured and the apartment comes with everything needed. I'll bring less clothes as there is a dryer too. Really good place. Indoor pool and sauna was a great surprise as it was windy and rainy during our stay. Literally across the road from the beach with lovely ocen views. Restauarnts on Tedder Avenue a short stroll away and the cafe in the building was excellent. Everything you needed. location is not an issue if you're driving. clean and spacious. has everything you need. we had a great stay! The cleanliness of this place is disturbing. The moment I walked into my bedroom and checked the blankets only to find unwashed period stains all over the duvet. Absolutely disgusting. Everything else is ok but in terms of cleanliness it's absurd. Please re-consider if you're looking into booking because I had a horrible time trying to sleep in that bed. My two sons and I had a short break whilst my husband was on business. The apartment we had was spacious and well-equipped. We were on the 19th Floor and we had magnificent views from just about every room in the spacious apartment. The location was perfect and it was quiet and relaxing. You could lie in bed at night and hear the waves breaking on the shore. You could access the large balcony from the living area and both bedrooms. From the Pacific Views Resort, it is a short walk to the beach and to Tedder Avenue where there are a number of restaurants where you can purchase a delicious, reasonably priced meal. There was a large television in the living room and one in the master bedroom. We wish that we could have stayed longer or afford to own an apartment like the one that we stayed in. 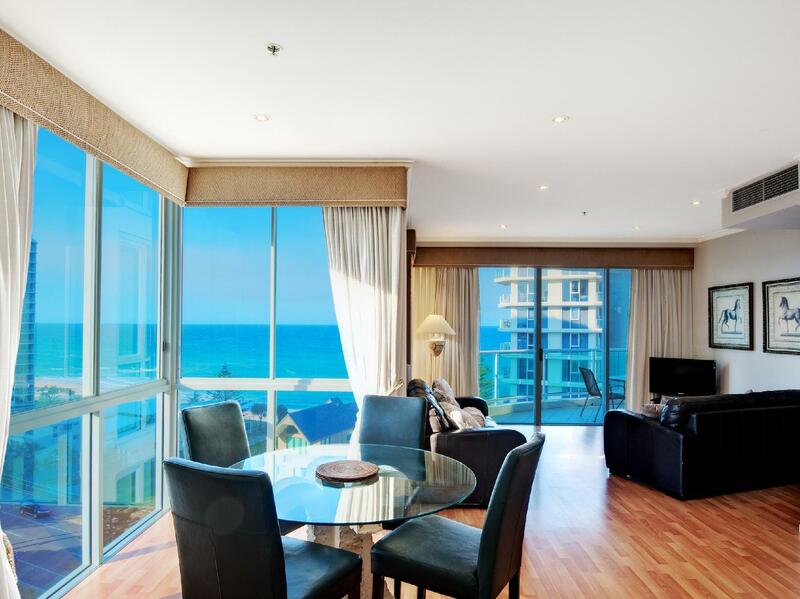 We will certainly consider staying at the Pacific Views Resort when we visit the Gold Coast again. Awesome, is the word we would describe this apartment. It comes fully furnished with cutlery, and laundry options and has a balcony with a heck of a view of the sunrise/sunset. It's not located very near Surfer's paradise but a short bus ride would solve that. The apartment also has a indoor swimming pool and sauna, but the pool isn't maintained properly as the water has an odd smell and it causes the skin to itc. Pool isn't heated but the jacuzzi is. However, the jacuzzi is dirty, with sand at the bottom of it and the water is foaming with grime and dirt. 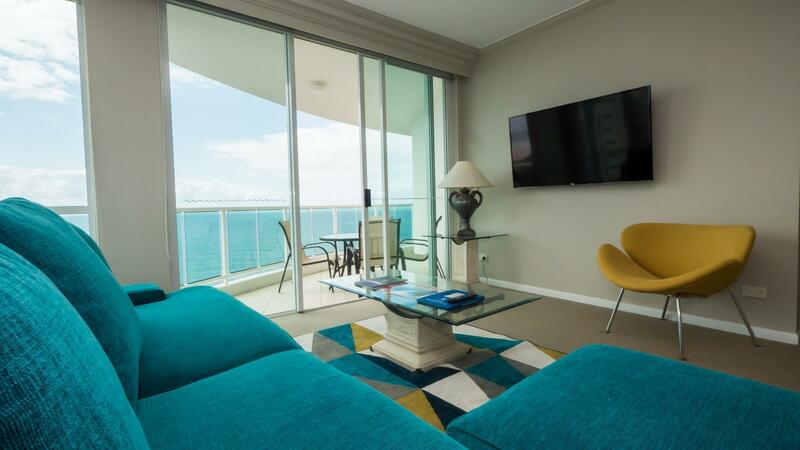 Besides this, the apartment is extremely clean, with comfortable beds, spacious dining area, and the toilet comes with a bath tub overlooking the beach. Great experience. My family loved waking up to the sound of the sea and watch the sunrise in the morning. Fresh clean towels provided. Soap, shampoo, even handy plast provided! Comfortable beds, pillows and hotel standard linen. Fully equipped kitchen with quality utensils and pots for cooking. Good size for family of 4. 7 eleven and subway downstairs. Would recommend it for anyone who loves the beach and want a little quiet from the busy Surfers's paradise. You will need to drive to get around. But it is a perfect quiet spot for a relaxing holiday. Unit size is decent and a complete unit for family. Furniture are adequate but a bit outdated in design. Cleanliness is not too bad but all the pots and utensils are old and dirty and need to re clean. Oven and toaster is also too dirty to be used. Everything else is decent. Firstly it is near the beach and the accormodation itself has many facilities including a nice pool. Attractions such as the Seaworld, Movieworld and Dreamworld are just in the vincinity. There are also many nice dining places around the accomoidation.